October is synonymous with many things: Sweaters, Halloween, National Sarcastic Awareness Month... But possibly the thing I most look forward to when October 1 comes around is the beginning of Pumpkin Chocolate Chip Cookie Season. It's not that I can't make these cookies at other times of the year. I can absolutely do that. I can also listen to Christmas music in April and eat snow cones in January, but some things just don't seem right. 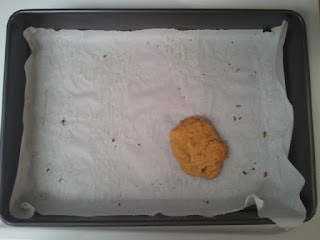 So, dear friends, in lieu of a pie recipe this month, I'm posting my version of Pumpkin Chocolate Chip Cookies. They are the perfect blend of sweet and spice and everything nice, and make it nearly impossible to have a bad holiday season. Enjoy! Scoop big tablespoons of dough onto the cookie sheet and bake at 350 for 15 minutes. The peaks should be brown, but the cookie still soft.